I hid in our mobile home’s kitchen cabinets when I was little. I would crawl right on top of the cans and stay until I scared myself thinking that no one would ever find me again or until I finished eating the small can of chocolate pudding (remember those green cans with the pull-back metal lids). Those cabinets were great hiding places which is exactly why they were terrible for kitchen storage. While these homeowners probably didn’t have a weird kid hiding in their kitchen cabinets eating chocolate pudding, their kitchen didn’t use space very well so a complete mobile home kitchen renovation was in order. 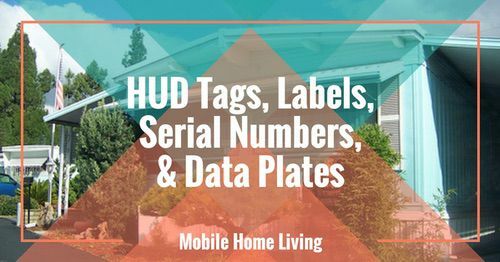 When the time came to retire, these busy empty-nesters downsized from a four-bedroom site built home to a much smaller two-bedroom mobile home in an active 55+ mobile home community. They love their new mobile home but the kitchen just wasn’t working. The previous owner made the living room larger and did so by stealing space from the kitchen. 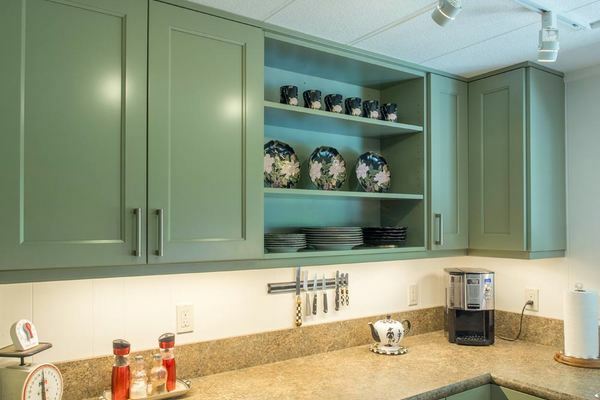 After the wall was removed they retrofitted homemade kitchen cabinets into the smaller kitchen. 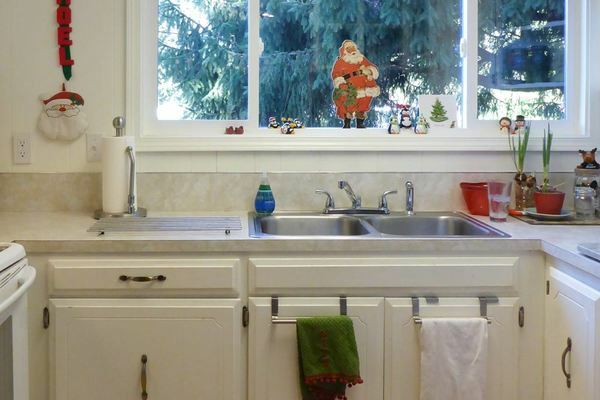 The mobile home kitchen cabinets were no longer aligned with the kitchen window and they were nearly falling off the walls and the lower cabinets provided little storage. The appliances were also outdated and the lighting needed to be better. 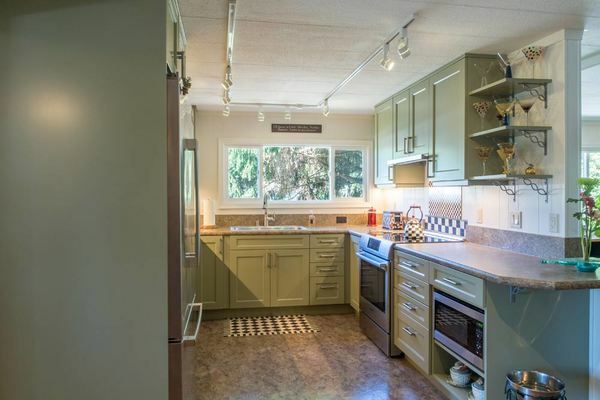 It was definitely time to for a mobile home kitchen renovation. The old mobile home kitchen cabinets were homemade. 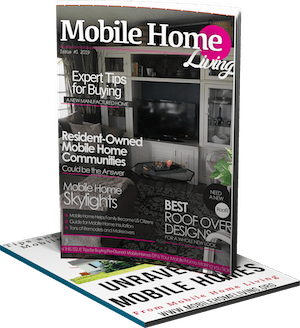 Buying a more affordable used mobile home allowed the couple to splurge a bit and hire a company to handle their mobile home kitchen renovation and design. Mobile home kitchen renovations are not for DIY newbies. 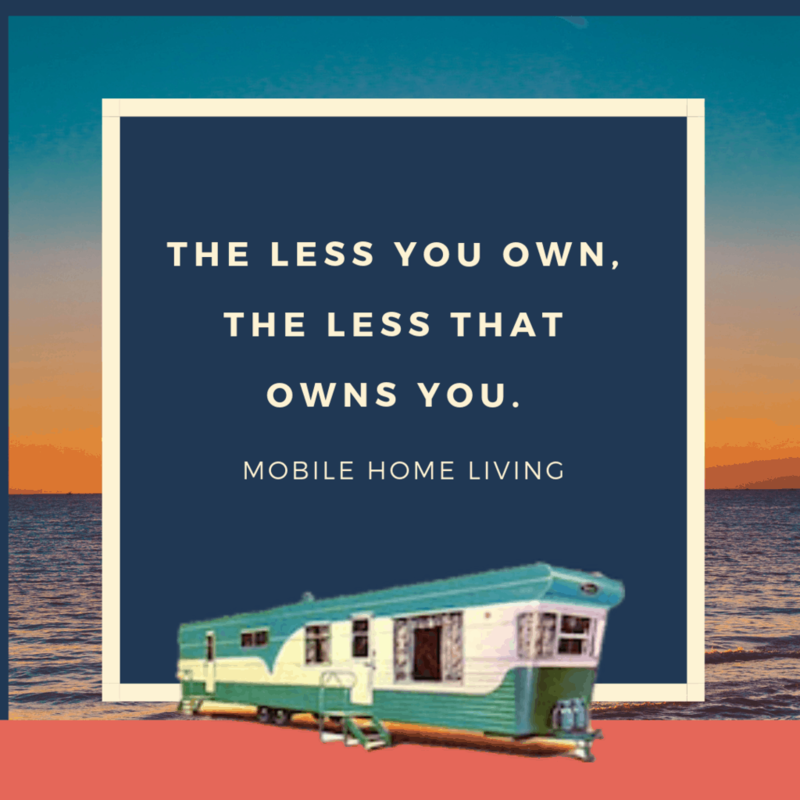 Don’t let all the remodeling success stories we share here on Mobile Home Living fool you, a mobile home kitchen renovation is a lot of hard work. 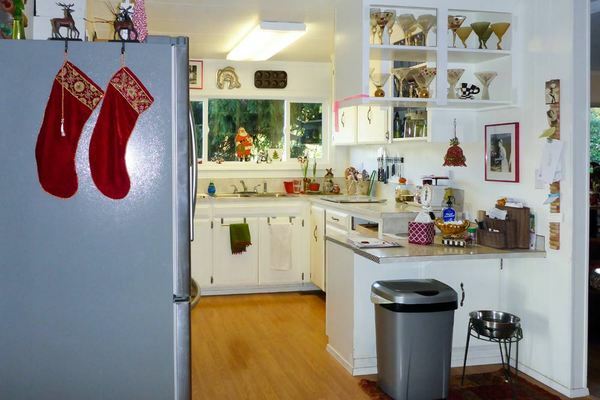 Complications usually plague most mobile home kitchen renovations and this one was no different. A limited slope for plumbing, extruded plastic ceiling treatments, and framing constructed of studs on the flat for the peninsula were only a few of the challenges during this remodel. The sink and window don’t align because the previous owners moved the kitchen wall to make the living room larger. It all worked out in the end, though! Knowing what you need in a new kitchen is an important part of any remodel. 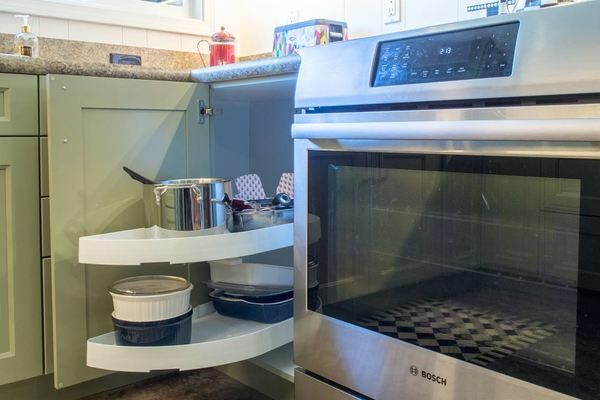 The couple’s primary objective was to add smarter storage that was easily accessible. They wanted their new mobile home kitchen cabinets to reduce the need to bend down or stretch up to reach things. The second objective was to provide a display space for their collectibles. Beautiful things should be seen, after all! The third objective was to incorporate a suite of appliances that enhanced their love of cooking and entertaining. 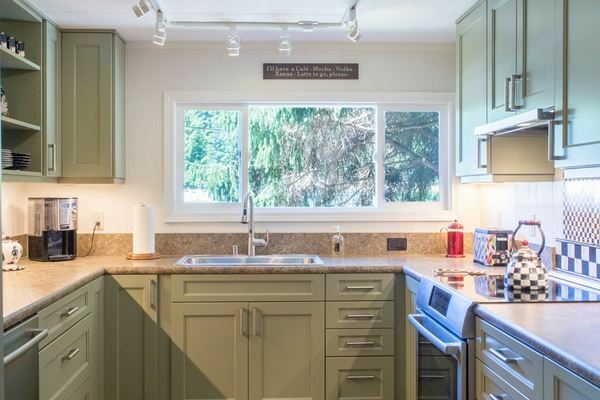 This mobile home kitchen renovation didn’t disappoint. The couple’s beautiful dishes are front and center. In order to maximize the storage, the under-counter water heater was relocated (and replaced) to a different area in the home. This made space for a super Susan to the left of the window. What is a Super Susan? A super Susan is an upgraded version of the lazy Susan. It does not have a rod in the middle of the shelves. Each shelf works independently on it’s own. They usually have ball bearings which makes them more durable and smoother. The shelf is also formed around the Super Susan shelving so nothing will fall off in the back of the cabinet.The name is very fitting. A Super Susan seems smart. The kitchen sink was moved to the left a few inches. Because the window was installed before the living room was expanded there was no way to center the two without moving the window. Moving the new sink over made enough room for new drawers. An oddly placed central heating vent was relocated to the toe kick of the cabinet and a blind corner cabinet with pull-out half-moon Susantrays was installed in the corner. The cabinets were painted and glazed, stylish countertops were installed, and on-trend luxury vinyl tiles make for a beautiful and functional kitchen. Anything is possible in a mobile home. The new induction range was moved over to the other side of the kitchen to create more counter space on each side of the range. Lighting was improved with directional track lighting, under-cabinet lighting, and lighting in the vent hood. This kitchen is ready for a magazine cover. The smart layout design in this mobile home renovation made it possible for two people to work together in the kitchen without bumping into each other. The kitchen is small but it is a storage powerhouse. 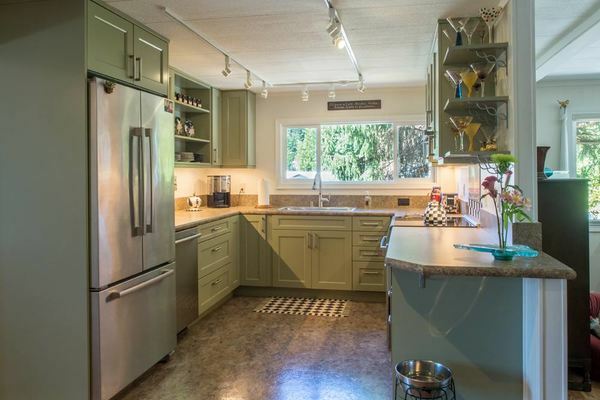 This mobile home kitchen renovation is a beauty and I’m jealous but at the same time, I’m inspired. 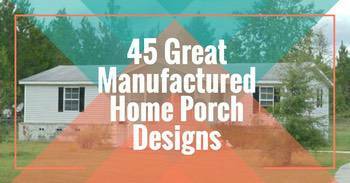 Honestly, it doesn’t matter if your mobile home is 2 years old, or 42, or if you have $500 or $50,000, you can create a gorgeous home and this home is a shining example of that. Big thank you to the homeowners and the contractors for sharing this mobile home kitchen renovation with us! Do you have a mobile home improvement project you would like to share? We would love to see it, comment below or email us today! I would love to get featured. How do I send you my photos and info? We’d love to feature you! All you need to do is email us at [email protected]. Just send one or two photos at first so we can keep it all organized and we’ll send you back a questionnaire and a link to send more photos (there’s a file limit on our email). Can’t wait to see your home! Love this website! I just found it by accident. Anyway we have a 1983 Titan, 14′ X 75′. Odd size? It’s a 3BR, 2 bath. We are remodeling…I am sad that we are on the last bathroom and never thought to do before and after photos. Also we did some adjustments to the layout for the purpose of making our master bath larger. I send pics if you’re interested…just now I’m going to jet off and take some ‘before’ shots of that bathroom….lol. I am always looking for photos and projects to share. 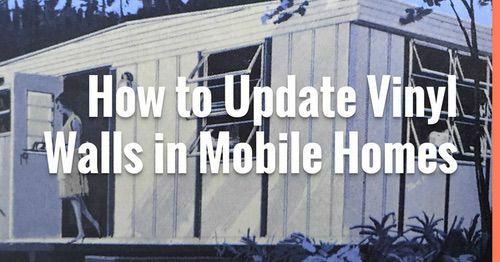 There just isn’t a whole lot of mobile home-related information online. I bet your home is gorgeous! My email is [email protected] – please email me! 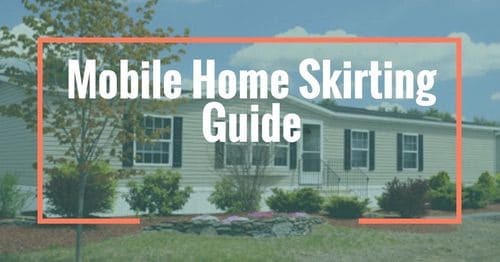 There is an awful lot of really bad advice surrounding mobile homes out there. I don’t think anyone would be able to say ALL metal roofing will leak once damaged – perhaps they are just really terrible at repairing metal roofs? I think whoever told you this has done a great disservice to you and doesn’t understand how metal roofing works (or any roofing for that matter). 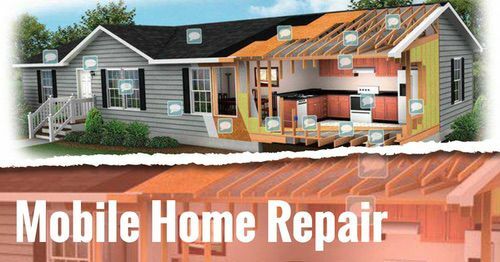 Why would anyone install something on their home if it could never be repaired? My husband, Rob, does gorgeous remodeling. He has renovated 2/3 of our 1972 Holly Park 14 x 70. Pictures don’t do it justice. All that’s left is our dining room and kitchen. Thanks for all your inspiration! I bet your home is gorgeous! I’m always looking for home remodels to share (hint, hint). Please email me at [email protected] if you’d be willing to share. I bought a 1975 single wide that was a complete disaster. Gutted the kitchen. Removed walls and lived in it with my young daughter during the Reno. It was quite the experiance but i have no regrets, the kitchen turned out amazing! This sounds like a story we need to hear, I love a good success story! I’m always looking for inspiring homes and rooms to share. Could I talk you into sharing your new amazing kitchen?